Chadlington is well served by First Great Western trains from Charlbury, with regular services to London Paddington via Oxford and Reading, and to Hereford. Charlbury has an outstanding railway service for this size of town. Its Brunel-designed station, in the Evenlode Valley below the town, is situated on the newly upgraded Cotswold Line. Trains run on a generally hourly basis to Oxford, Reading and London Paddington, and in the other direction to Worcester and Great Malvern. Most services are operated by comfortable Inter-City trains. Travel time is around 1hr30 from London and 20mins from Oxford. 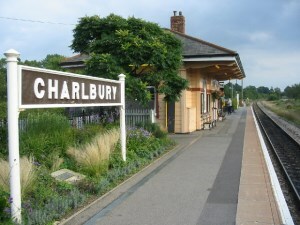 Charlbury station has recently undergone considerable refurbishment after the re-opening of the second track between Ascott-under-Wychwood and a point east of Charlbury. The second platform has been reinstated, a new footbridge sensitively constructed and the car park extended and upgraded.